Everyone has their favorite editor. Some use pen and paper. Many use Word, or a text editor like Notepad or Notepad++. Others use online tools like Google Docs. I have tried all of the above and finally settled on Emacs. For those who haven’t heard of Emacs, it’s a highly customizable editor that is used for a variety of tasks from writing text to writing code and everything in between. As the late Billy Mays used to say, “But wait! 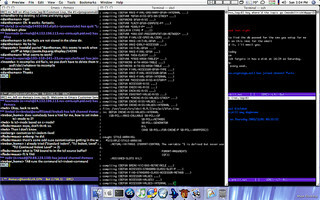 There’s more!” You can use Emacs to read, write and send your Email. You can use it as a calendar, a journal, a planner, a debugger and even a news reader. And it is open source. Completely, 100%, free! But this flexibility comes at a price. It is not as simple as opening up a Word document and typing away. Well, you could, but to get the full benefit of Emacs, you should customize it and that takes some tinkering. I’m not going to go into detail about how to use Emacs, at least in this post, but there are lots of tutorials out there if anyone is feeling adventurous. What I’m going to do instead is talk about a few of the features that I like about Emacs. Emacs uses the term buffers to areas of the screen. So if you writing a document, it will be in a buffer. You can have a single buffer in a Emacs window (called a frame), or split the window (vertically or horizontally) into two buffers. And you can keep splitting till you have a patchwork of buffers each showing a different document. It’s kinda like opening up multiple documents in Word and lining them up side-by-side but way easier to do. Anyway, Emacs buffers also have modes associated with them. A mode affects the buffers behavior (whether it is wrapping words or highlighting/coloring parts of the text). I write in Org mode. Org mode is great for (straight from the horse’s mouth) “keeping notes, maintaining TODO lists, planning projects, and authoring documents with a fast and effective plain-text system.” In short, it’s great for writing. The best part is that you can expand and collapse your TODO lists and notes by pressing the TAB button. I keep all of character sketches, timeline, plot ideas, chapter breakdowns as these expandable lists right in my document so I can refer to it when I write. If I need to keep referring back to something while I’m writing, I can simply create a new buffer next to my document and load the information up there. You can also customize Emacs to include version control. You know that thing you do when you save your drafts as “Draft-1.doc”, “Draft-2.doc”, “Draft-2-newchapter3.doc”, “Draft-3-stellagetskilled.doc”, and so on. Except with version control you can do it a whole lot better and without cluttering up your hard disk. Caveat: some expertise required. The one drawback with Emacs compared to something like Google Docs is that your data is not automatically backed up. I use Dropbox and that takes care of that. If you are feeling adventurous, or you are a technophile, or you are familiar with Emacs but never thought about using it for writing, check it out. Now, what editor do you use to write your books? Posted in Thoughts on Writing and tagged writing tools. Bookmark the permalink. You definitely should. The learning curve can be a bit steep but it is definitely worth it.